After barely making the NASCAR Cup Series playoffs Round of 12, Aric Almirola had a chance to win at Dover and secure a place in the next stage. But with about five laps to go, Almirola was involved in a major crash that also damaged Alex Bowman, Martin Truex Jr. and Brad Keselowski. 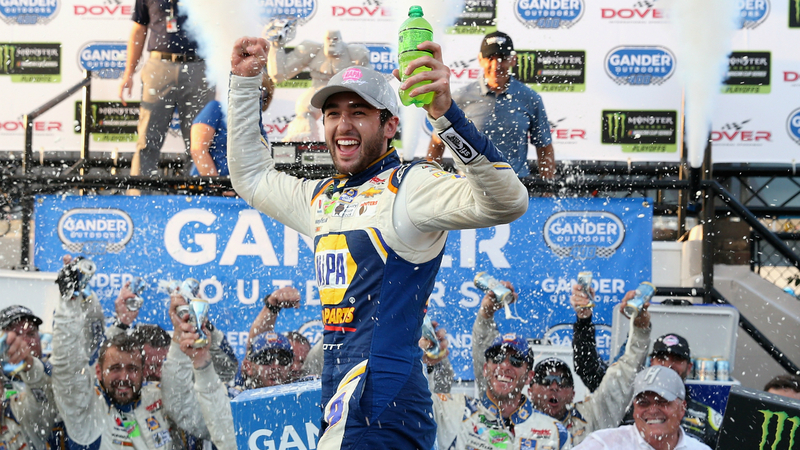 That allowed Chase Elliott to claim victory despite leading just 11 laps. Joey Logano was the next-best playoff driver to finish, coming in third, while Kurt Busch slid into fifth spot. Bowman and Clint Bowyer had the worst runs among playoff contenders. 5:42 p.m. — Chase Elliott wins it! He led just 11 of 400 laps, taking advantage of the late crash to come out on top. Big win for him. 5:37 p.m. — There will be overtime. Who is going to claim this? 5:33 p.m. — So it’s heartbreak for Almirola, who was about five laps from a win and is now in big trouble moving forward. 5:31 p.m. — Here’s a visual on that. 5:30 p.m. — Big wreck. For the second straight week Keselowski is involved. Red flag is out. 5:28 p.m. — Update: Clint Bowyer is done. 5:26 p.m. — Bowyer is having problems. 5:24 p.m. — Ten more. Almirola, Kurt Busch and Elliott are in front. 5:20 p.m. — Twenty laps remaining. Almirola is still holding on. 5:14 p.m. — Elliott is up to fourth place. 5:07 p.m. — We can’t overstate how huge it would be for Almirola to get this win. He’d go from potential elimination this round to an automatic spot in the next one. 5:05 p.m. — The green flag is up after a caution for an axle in the middle of the track. 4:57 p.m. — Truex Jr. heads to the back after speeding on pit road. 4:54 p.m. — With 60 laps to go, it’s Almirola, Bowyer and Truex Jr. leading the pack. 4:48 p.m. — Harvick has to pit again and Almirola is now in the lead! PENALTY: @KyleBusch caught speeding on pit road. 4:40 p.m. — Larson is all the way back in 16th place. 4:33 p.m. — Here comes Keselowski! 4:28 p.m. — Blaney is doing some bobbing and weaving here. He’s in eighth. 4:19 p.m. — Aric Almirola is up to second place. 4:11 p.m. — It’s been a rough race for Brad Keselowski so far. He’d been one of the hottest drivers going for a while, but he crashed out last week and is in 10th right now. 4:06 p.m. — This stat gives you a sense of how dominant this performance has been.
. @kevinharvick has now led 202 of 400 laps. 4:01 p.m. — Bowyer is trying to make a move right now. 3:51 p.m. — We’re through 200 of the 400 total laps. Top 5: Harvick, Bowyer, Truex Jr., Logano, Kurt Busch. 3:43 p.m. — Some movement at the top, but Harvick is still in first. Truex has moved around Logano for 3rd. Bowyer continues to run about 2 seconds behind Harvick for the lead. 3:32 p.m. — Bowyer is up to second place! 3:29 p.m. — Close call for Kyle Larson. 3:22 p.m. — Penalty for Chase Elliott. 3:08 p.m. — Stage 1 is over. Harvick, Joey Logano and Kyle Busch pace the field.